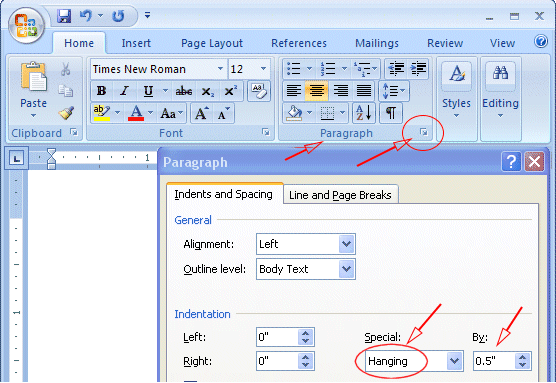 When you first start Word 2013, you are placed under the Home tab (like in the image below), if not, click on the Home tab. Click on the font and select Times New Roman. Click on the size and select 12. Note: If you already typed your text, you need to select all your text before you select the font in order to apply the text to the new font. To select all text, press CTRL+A (that means holding down the CTRL key, keep holding it then press the A key on your keyboard). Click on Page Layout => then click on Margins. Make sure the margins for top, left, bottom & right are set to 1″. To create a header with your last name and automatic page numbering, click Insert => Page Number => Top of Page => then click on Plain Number 3. Now type in your Last Name and leave a space before the page number. Note: make sure the font is being set to Times New Roman and size 12. Click on the Line Spacing button. Immediately after typing the final line of your paper, press the CTRL key and the ENTER key at the same time to begin a new page (another method is to insert a page break from the toolbar). Your header with your last name and automatic page numbering should appear at the top right of your paper. The feature to setup indentation on the subsequent line/lines is called Hanging Indent. To setup hanging indent, click on Home => click on Paragraphs => under Special, choose Hanging => enter the value By 0.5 (or 1/2 inch) => click OK to apply the settings. Now type your sources. If you have Internet sources, when you type in the URL, Microsoft Word automatically apply the hyperlink to it. You should remove the hyperlink by right-clicking on the URL => choose Remove Hyperlink. Excellent, it is very helpful. Quite helpful. But I could not find the method of incorporating long quotations in the body of the draft. This was very helpful, i will use it for my class project. 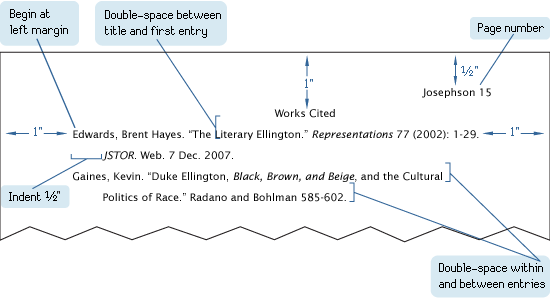 What do I do if the word “header” with a line above it is still below my essay? Such a life saver ! Or should I say grade saver ! It was very useful for my English essay. Totally behind in my college assignment. This was helpful and I liked it. I hope this work better for me. This was helpful, thank you. I hope this works for my class or rather I hope I did everything correctly. Its been many many years for me as well, but got to write something. I found this information helpful due to I have been out of school for many years and haven’t written a paper since high school or even previous college years ago.